We are all in our own different journeys and from time to time, we may find large boulders or other forms of obstacles in our path. However, this doesn’t mean we cannot reach our destination or even strive to go even further than initially planned. The above reminder was encapsulated in the Sibongile Khumalo’s “Reflect. Live. Celebrate.” tour performance. A performance in which she shares her journey as she celebrates 20 years in the music industry and the legacy of her father. The tour started here in Grahamstown at the National Arts Festival. The next stop will be Cape Town, then it will move/end in Johannesburg. This tour performance is really a must-see-performance for any of Sibongile Khumalo’s fans. It is music across genres morphed with poetry and good old fashioned storytelling. In a nutshell, it is a spiritual performance, literally with a few gospel numbers — her own compositions yet to be recorded — and other numbers that simply reinforce the idea that music is the food for the soul! Below is the work of a (relatively) young artist, Michael Selekane, which I acquired in 2009 during the Grahamstown Arts Festival. To this day, I remain very grateful that I made the acquisition. I didn’t have the 850 ZAR that it cost, but like a vulture I circled the piece for a few days until I could no longer resist the temptation to sink a little bit deeper in the abyss of credit card debt. I was beyond certain that I had to have it: I was completely smitten and besotted by the piece that the mere thought of it gracing someone else’s wall brought sinful imagery in my mind, heart and soul. Looking at it, and reading through the title itself, “when I was rich”, I understood like never before that richness has so many dimensions to it. 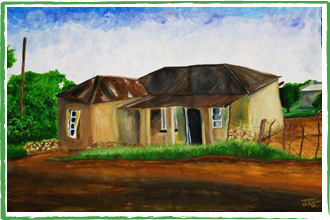 I understood why the voice of nkhono ‘Machale –the granny that took care of my two sisters when they were babies– had so much affection when she referred to her home as leqhofa; a Sesotho word for a deteriorating house left by a deceased loved one –typically male because of the (customary) laws of ownership. For nkhono ‘Machale, her house, which was smaller but akin to the one captured by Selekane was a home because it represented the richness of her life. It is perhaps unfortunate that it took Selekane’s work to truly appreciate this fact. In my mind, she was poor to the day she died. I neglected all the other possible dimensions to richness. The contentment, joy, and gratitude that nearly celebrates everything, from the sunrise, the birds to having something to eat, a roof over your head, and a neighbour that is sincerely interested in knowing how you are in greeting you. I am yet to attain such richness of life but I am nonetheless fortunate to have a symbolic reminder on my wall of what I aspire for. An honest and simple life with many dimensions to it that quantify its richness! The annual Grahamstown National Arts Festival is over. I hope the event delivered on its promise and offered an “amazing” experience to all patrons of the arts. Personally, I remained amazed at all times. Mostly at the good quality and variety on offer; but on few occasions, by the ‘no value for money’ type of performances, which paled in comparison to what one would expect! Now that the festival fun has ended, it is time to move on with life as we know it :-(. Before I proceed with mine, I would love to share with you my swan experience. I watched the Swan Lake for the first time ever and I thoroughly enjoyed it! A few days later, I watched Three is a Crowd, a contemporary dance performance with a piece on the swan. This piece, similar to the ballet performance, was beautiful and graceful. However, despite this seemingly satisfying experience, I was left with this nagging question: what makes a swan a fascinating creature? Upon reflection, I realised that through my pursuit of (Western) cultural capital, I had somehow learnt to see (and perhaps define) a swan as a seriously wonderful and numinous creature. As a result, it was easy to be wowed by the performances without connecting emotionally to what was being expressed through dance. In fact, I think as soon as I saw the white tutus, my mind was in autopilot and this simply made my swan experience a mind over heart experience. In some ways I guess this was expected. I grew up not knowing anything about the swan; I grew up knowing a peacock as the only graceful and beautiful bird. Growing up, I continuously heard “pikoko e khaba ka masiba”, an expression that alludes to the beauty and grace of the peacock as imbued by its feathers. For this reason, as a young girl all I ever wanted was to be decorated like a peacock so that I could walk with my head held high. Here I am talking about that gentle and confident walk better described in Sesotho as “ho tebuka o ba o khethela leoto sebaka”. Basically, in this walk, one appears as though they are gracefully contemplating placement of each foot before moving. It is like they are communicating a sense of worthiness that is symbolic of love in its purest forms. So you can’t but help to see beauty permeating from the walker just as you see beauty of the peacock. Yesterday I went to a jazz performance by Selaelo Selota and (ntate) Ngwako Manamela. Lets just say because of the vibes, it was indeed a hot night in Grahamstown 🙂 . Early Wednesday afternoon I went to watch Bubbly Bosoms a show that disappointed me beyond words. This was an all women cast and production so the sista went to offer her support! But truth be told, I left there remorseful because I felt the play was unrehearsed. In my eyes, it seemed like these ladies had told themselves that their experience was sufficient to pull off a show without necessarily rehearsing! There was this particular scene where only one person literally remembered to open the door to the taxi when entering. Also, for this particular scene, the driver forgot half of the time that she was sitting behind the wheel. The cherry on top was when the driver just upped and walked straight through the windscreen to join in on the singing (bypassing the steering wheel, of course, and moving towards the left and not the right where her door should be). At this point I wasn’t laughing! I felt like upping and going, but I couldn’t; and this had nothing to do with the fact that I might be well mannered. I couldn’t because I was shocked that a potentially insightful portrayal of struggles of different women joined together by their stokvel membership was being destroyed by an assumption that we were either a very stupid audience or we believed that whoever said that the devil lied in details lied! I really and truly was disappointed because this was a show with a number of acting veterans who should have understood that value for money simply lied in the details! Later in the evening, I was due to attend yet another show which I had bought the tickets based on the names of the cast and … lets just say I was filled with cynicism. But the cynicism itself wasn’t enough to stop me from going. So I got suited up for a cold Grahamstown weather and went to watch The Suit. The show didn’t exactly start on time and the theater was packed beyond safety considerations. I sat there before the start wondering how I would escape should anything happen — and this thought stayed with me for a few minutes beyond the start of the show, in part, because of one or two people that were allowed in after the start. As the storyline began to shape up, these fearful thoughts about my personal safety gradually melted away until all that was left was joy and delight. The Suit is a four person cast show with one of the cast members playing multiple roles in manner that brings realisation to this fact only as an afterthought! There is humour but behind it you get several powerful messages. For example, you get to realise how sometimes the use of alcohol to mask pain may also lead to a distortion to ones character to a point where forgiveness becomes an impossibility. You had this one character whose drunk version brought the beast in him but you could sympathise with him to a degree because you understood that the combination of alcohol and masking a pain of betrayal is lethal! I truly loved every second of The Suit because the delivery and the meticulous attention to details was excellent. I felt my intelligence was valued and so was my money. The bitterness of earlier in the day was totally removed because these acting veterans appreciated that experience means you don’t stop at working to give your audience quality and value for money show. Thank you to all who worked on this show; it was absolutely brilliant. Yesterday I went to see two performances: Simply Blue and Acoustic Soul. Both but in different ways qualified as music to my ears. Simply Blue is a group comprising of 12 boys from Bishops College, Cape Town. There were fairly good though I felt they were a bit under-rehearsed. I loved their repertoire. However, I didn’t love the fact that each time they didn’t know what to do with their hands they thought putting them in their pockets was the coolest thing to do. I imagine that is possibly cool but I am from that generation where such behavior would have been discouraged by sewing together their pockets …finish and klaar! After the Simply Blue performance which was good enough to end anyone’s blues, I went to see Acoustic Soul. They were excellent! I went there specifically to see Injairu perform. Seeing her was like watching a woman who has found her voice and her calling in life. She looked ultra beautiful and confident on stage. It really seemed like she had gotten her answer about her calling by having a face-to-face conversation with “Mmopi, Mmoloki, eena ea kalletseng maru”; I am talking about the one and only Alpha and Omega called by which ever name you are comfortable with. Injairu rocked so did each member of that group. I am merely putting emphasis on her because I was filled with so much pride seeing her perform. I guess to me she was like a flower at spring time blossoming for the first time; in my eyes she ceased being just the baby of the Kulundu’s family. That said, the entire Acoustic Soul performance was very soulful. I left there feeling a bit poetic and without any doubt whatsoever that a higher being exists though it may be understood differently by different souls. Chronicles is actually a student production but you would be forgiven if you thought otherwise. It is a contemporary dance piece by Tshwane University of Technology (TUT) chronicling various emotions that we all share as human beings. There was love, passion, sadness, joy and everything else in between that carries the hope and courage to live yet another day. The second piece, I think it was titled Death of Dreams or Memories. This piece was very profound. It was about letting go of old dreams, mourning them and being totally liberated to pursue what the present and future have to offer. Again the music was also instrumental in helping to convey the message. Personally, it took the music together with the dance to fully appreciate that tentativeness that one has after experiencing loss and disappointment. I am talking about that slow urge to move on with life but not quite knowing what and where to go. Then discovering later that you can find liberation in the decision that you made (right or wrong) and eventually you might just learn to be content for who you are not who you thought you might be. As I said, this I found to be a profound piece and because of it I understood why people say life is a dance. The third and last piece of the chronicles was titled English for Immigrants. It was about loyalty. Watching it, I got reminded of an old TV show called ‘mind your language’. The piece also invoked the imagery of miners doing the gumboot dance, yet the actual dance that was being performed was very different. I found this very interesting because this created a familiar connection to how song and dance are used by immigrants to maintain focus as they work towards a better future for them and those left behind. This focus ultimately is what breeds loyalty that is so strong that elements of patriotism also come to the fore. To finish off my posting, Chronicles is certainly a must watch performance. It will remind you that dancing through what life has to offer is better than simply sitting it out!